Well the days are flying past at the moment and Valentines day is just round the corner for all you love birds so we have been busy coming up with a few designs. 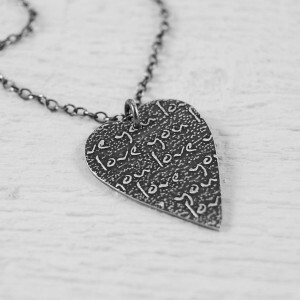 The first of which is this silver heart necklace which can be personalised with the words of your choice. I had been wanting to try etching text in relief for some time now and this is my first attempt and I have to say I was really pleased with the way it came out. After etching the text onto the silver heart which I cut out from sterling silver sheet by hand, I oxidised it and then popped it in my new tumbler (so excited to finally get a tumble polisher that everything is going in it at the moment!) and crossed my fingers! I love the effect it has given it as the pendant has a real shine to it – which is difficult to portray in the photograph – and the writing is highlighted but in a subtle way – a really unique way to express your feelings. And don’t just limit it to Valentine’s Day it also makes a great engagement, wedding or anniversary gift. Short phrases such as Be Mine, True Love and even Marry Me work best on this necklace and we have a few ideas coming up for those of you who have a bit more to say! This entry was posted on Wednesday, January 27th, 2010 at 9:18 pm	and is filed under Handmade Jewellery, personalised jewellery.